The first, articulated by some analysts, holds that lower-cost tablets have nothing to worry about. Reuters collected their comments in an article giving shape to their general lack of concern. The reason? The entry-level Mini's $329 price, enough to give it distance from cheaper tablets on the market. 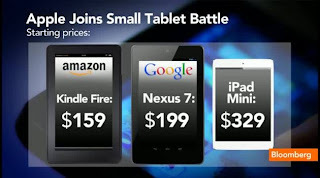 A note from Nomura Equity Research indicated that "demand for Google's Nexus 7 and Amazon's Kindle Fire is unlikely to be much affected by the launch of the Mini given the significant price gap," Reuters reported. The second view says that the price difference won't matter as much as some analysts think. AllThingsD found several analysts who share that view. As J.P. Morgan analyst Mark Moskowitz told the outlet: "Should Amazon and Google be worried? Yes, they should be worried." The argument here is that Apple greatly expanded its pool of potential buyers by making its entry-level tablet $329, while shrinking the pool of potential buyers for Android tablets by a corresponding amount. Given that cheap tablets compete primarily on price, the thinking goes, the cheaper iPads get, the more difficulty Apple's competitors will have. But there's a third way of thinking about the situation, which has gotten less attention. It's related to the first two lines of thought, and it goes something like this: Android-derived brands like the Kindle Fire and the Nook will thrive in an iPad Mini world -- but devices based on a more pure version of Android will struggle. Price wise, the iPad Mini is no threat to the low-end tablet. Buyer are also more conscious in their purchase. They know that when they purchase a low-end tablet, their expectations are limited. They get their money worth. However, the iPad Mini with its Apple quality surely have set the standard higher for low-end tablet. Soon it will no longer be acceptable to have a simple resized app that was made for smartphone, to fill the tablet screen. The app must be optimized for the tablet experience. No shortcuts are acceptable. But there was Phil Schiller, the company’s senior vice president of worldwide marketing, whaling away on the Google Nexus 7′s pitiful stretched-out phone apps during the iPad mini unveiling. With Microsoft releasing Windows 8 and its Surface tablet, the tablet market is getting very interesting. Soon we will start seeing tablet that are cheap but of good quality. There are already rumors of sub-$300 Windows 8 tablet. The thought of having native Windows applications like Office, Outlook, Firefox and traditional desktop applications running on a tablet will make life a lot easier. Hunting for apps that performs similar function is no longer necessary. The tablet war is heating up. It is getting more interesting. We will soon see a booming cheap and good tablet PC market. Where good actually means great!